Join us Monday, January 22nd, 2018, at 7:15 pm in our Springfield location. 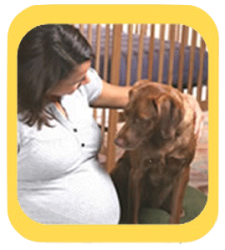 Dogs and Storks workshops teach expectant families to understand their dogs' sensitivities, body language, and attention-seeking behaviors by providing practical education during pregnancy and continued support after the baby arrives. Licensed Dogs and Storks presenters help to address the concerns of expectant parents, decrease the stress associated with baby's arrival, and ensure the safety of all family members. These educational sessions are for people only. Please leave your dogs at home! Parents, grandparents, and childcare providers: any adult who will be caring for your child is welcome to attend for one flat family registration fee.